Britons who travel to "war areas" should be presumed potential terrorists unless they can prove otherwise, Mayor of London Boris Johnson has said. Writing in his Daily Telegraph column, he called for tougher powers to deal with British extremists who leave the UK to fight in Iraq and Syria. He said there should be a "presumption" that Britons who go without telling UK authorities have a "terrorist purpose". Deputy PM Nick Clegg said changing the law would not help defeat extremists. And former attorney general Dominic Grieve said Mr Johnson's proposal undermined UK values. The Human Rights Act states that anyone charged with a criminal offence in the UK is "presumed innocent until proved guilty". But Mr Johnson wrote: "The law needs a swift and minor change so that there is a 'rebuttable presumption' (which shifts the burden of proof on to the defendant) that all those visiting war areas without notifying the authorities have done so for a terrorist purpose." Mr Johnson also said he wanted stronger monitoring of extremists and suggested the government could bring back control orders, under which ministers could sign an order placing a suspect under close supervision. The first question I would ask is, what is the real necessity for this? The orders were replaced in 2011 by the weaker Terrorism Prevention and Investigation Measures (TPims), which restrict movement, the use of computers and mobile phones, and meetings with others. Mr Johnson said Britons returning from Iraq and Syria would need "surveillance at the very least". "If we have to bring back control orders for some of the more serious risks, we should do so immediately," he said. People who "continue to give allegiance to a terrorist state" should have their citizenship taken away, Mr Johnson added. He said Britain must try to close down Islamic State (IS), warning that if nothing was done it would mean "a tide of terror will eventually lap at our own front door". He devoted much of his column to calling for a stronger military response against IS forces. While recent UK military interventions had left the nation reluctant to get involved in overseas conflicts, he said, "doing nothing is surely the worst of all". With the US and UK keen to avoid sending in troops, he said fighting IS would "probably need a vast and co-ordinated series of American strikes by drones and other missiles, coupled with a lot of effort from special forces". 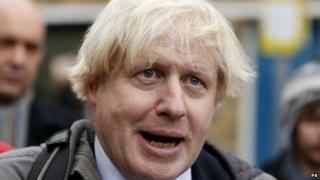 Mr Johnson said failing to act would be "allowing a new and hideous regime to be born". "The place would be a giant training ground for terrorists and wannabe jihadis. We need to try to close it down now, before it gets worse," he said. "What is the point of having a defence budget if we don't at least try to prevent the establishment of a terrorist 'caliphate' that is profoundly hostile to civilised values?" Mr Johnson has overall responsibility for the Metropolitan Police which believes that about half of the 500 British jihadists who have gone to Iraq and Syria to join IS are from London. Commenting on Mr Johnson's proposed law change, Mr Clegg said new legislation would not remove IS, and the government should focus on working with Muslim communities in the UK. "I sometimes wish it was as simple as Boris Johnson implies: all we need to do is pass a law and everything will be well," he said. He said existing powers would be kept under review, but the UK already had considerable powers to keep itself safe. Mr Clegg also rejected Mr Johnson's calls for Britons fighting abroad to be stripped of their citizenship and for the reintroduction of control orders. Mr Grieve, who left his role as attorney general last month, told BBC Radio 4's The World This Weekend that Mr Johnson's proposal for a presumption of guilt would be a major change to the law. "It is a draconian proposal because it would envisage getting rid of ordinary principles of common law which put the burden on the prosecution to prove its case by introducing a rebuttable presumption," the Conservative MP said. "The first question I would ask is, what is the real necessity for this? "We have successfully prosecuted a number of individuals coming back from Syria having engaged in terrorist activities or training. "If we were to do this we would be undermining our own values and ultimately because this is a values battle that is not likely to be helpful in persuading people not to become terrorists." Mr Grieve said there were "perfectly innocent reasons" for people to visit Syria, including seeing their families or taking medical aid. Home Secretary Theresa May has proposed changes to the law to tackle extremism and radicalisation in the UK. On Friday she said she was "looking again at the case for new banning orders for extremist groups that fall short of the legal threshold for terrorist proscription, as well as for new civil powers to target extremists who seek to radicalise others". The announcement came after the killing of US journalist James Foley by IS militants, apparently including a man with an English accent. Meanwhile, Downing Street has said the UK is stepping up efforts to defeat IS militants. Lt Gen Sir Simon Mayall has been appointed security envoy to the Kurdistan region of Iraq, which has been threatened by IS's recent advance. Kurdish forces will be supplied with non-lethal equipment such body armour and night-vision goggles.